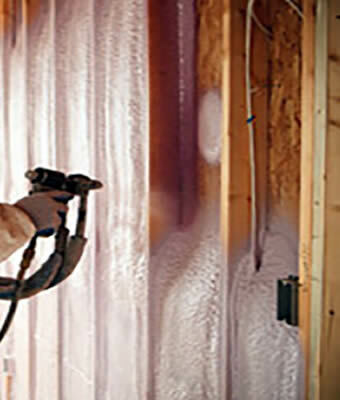 CORBOND® is an insulating, spray-in-place polyurethane foam. This type of material has been used for years in thermos bottles, refrigerators, commercial freezers and coolers, but it took a company like Corbond Corporation to research and develops ways that polyurethane can be used effectively in the insulating of homes and commercial buildings. The purpose of buildings for people is to isolate them comfortable from a hostile exterior climate. The purpose of insulation is to develop this climate isolation beyond the minimum to allow complete modern interior climate control. To achieve this climate isolation successfully requires isolation between interior and exterior air and moisture and the system must be reversible so the building may be both heated and cooled efficiently. By its solid cellular plastic, fully adhered in place nature, CORBONDR achieves the climate isolation necessary in the thin space of the building cavity. Exterior and interior climates cannot mix so no compromise of climate isolation can occur due to the exterior climate. Does CORBOND need venting like conventional fibrous insulations? CORBONDR does not need venting. Venting was designed to carry moisture out of fibrous insulation so it can maintain its thermal efficiency by trapping dry air. With CORBONDR, no air can enter into or through the product, as it is solid cellular foam. Since no air or moisture can get in or around it, it need not be vented off. How does CORBOND control moisture movement and condensation? Most damaging moisture within a building envelop cavity is the result of warm moist inside air being exchanged with the cold dry air inside an insulation cavity. As the moisture in the air condenses, it forms dew and/or frost within insulation. Because CORBONDR does not allow movement or exchange of air within the cavity, this moisture movement and condensation does not occur. CORBONDR is ideal for use in climates where buildings are both heated and air conditioned because the situation is reversed in summer with moisture on the back of the interior vapor retarder. No. Spray-in-place polyurethane insulation and particularly CORBONDR does not contain formaldehyde resins. CORBONDR is made of resins similar to popular polyurethane varnishes of wood. At what point of construction is CORBOND sprayed into place? CORBONDR is applied before the sheet rock is put in place but after plumbers and electricians have completed rough-in work. The spray-in-place product creates bedding around pipes and closes all penetrations in and through the exterior walls of the structure which completes a nearly monolithic insulating blanket. CORBONDR can be installed quickly even in extreme weather conditions. An average house of 1300 square feet may take a trained crew 5 to 6 hours to complete. Yes! CORBONDR product uses a new generation of environmentally friendly ingredients. CORBONDR now contains no CFC’s. Also, its superior insulating capabilities dramatically reduce heating and cooling demands, reducing harmful emissions from power plants and home heating units. What happens if the owners wanted to add an electrical outlet once CORBOND is installed? If an outlet must be added, CORBONDR drills more easily than wood. There is also typically a small space left between the wall board and the CORBONDR so a wire can slide through. Can you drill holes in existing walls and fill them with CORBOND? No. When CORBONDR expands it is very strong. As a result it may distort a closed wall cavity and then set up hard. CORBONDR is always sprayed into an open cavity. This allows for a better job quality control because the technician can see what is being insulated. How long does CORBOND last? Indefinitely. As an inert, long lasting polymer plastic, a house wall or commercial structure is the perfect place for CORBONDR to do its job for a long time. © Insulation Specialists, Inc. All Rights Reserved.